A book published annually by a school within which are images of students arranged by class or grade. Also included are images of instructors and staff, as well as images of special events, clubs and their members, academic competitions, dances, alumni visits, and other noteworthy occurrences. In many cases, the school yearbook is put together by a group of student volunteers, mentored or sponsored by a faculty member, making the yearbook a portrayal of student life by and for students. 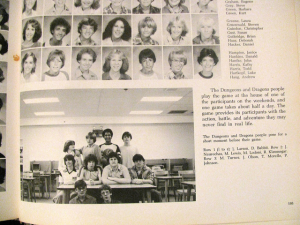 "LHS Yearbook 1980, Page 193, January 28, 2012" by Eden, Janine and Jim is licensed under CC BY.